The Martian stars Matt Damon, Jeff Daniels, and Jessica Chastain and is directed by legendary science fiction director Ridley Scott. During a manned mission to Mars, a sand storm forces the team to perform an emergency evacuation, during which the team botanist, Mark Watney (Damon), is separated from the rest of the group and presumed dead. However, Watney survives and is left stranded in an abandoned research base, alone with minimal supplies, millions of miles away from anyone who can help him. With almost nothing to work with, Watney must cobble together ways of growing food, creating water, and contacting NASA. When NASA discovers that Watney is alive, NASA director Teddy Sanders (Daniels) and officials Vincent Karpoor (Chiwetel Ejiofor) and Mitch Henderson (Sean Bean) must find a way to supply and save Watney before his supplies run out. I was really looking forward to this film, not only because it’s directed by Ridley Scott, who directed my favorite movie, Blade Runner, but also because this movie looked like a mixture of Castaway, Apollo 13, and Gravity, three movies that I really love and a concoction I had high hopes for. The Martian did not disappoint (too much). By far the best parts of this film are when we are alone with our hero, Mark Watney, on Mars. Matt Damon performs seamlessly and the character he portrays has such a magnetic personality that you really want to spend the entire movie with this guy. His character is witty, funny, and very intelligent and the most interesting parts of the film are when he is trying to figure out how to survive on this lifeless planet. The parts of the story that take place outside of Mars, specifically at NASA, are the weaker parts of the film in my opinion. Not that these sections are bad, but they are a heck of a lot less interesting than Watney trying to MacGyver a way to survive on Mars. In addition, not many characters are fleshed out. We are supposed to sympathize and like characters we hardly see throughout the film. Also, I feel the rest of the Mars team could have been done much better. We are introduced to the Mars team in the very beginning, but the storm happens not five minutes in and after that we don’t really see them until the end of act two. Despite this, there are many plot points centered around them such as NASA not telling them that Watney is alive and the guilt that commander Lewis (Jessica Chastain) feels for leaving Watney behind to die. They all fall flat because we never really get to know or explore these people, their distinct personalities, or their friendships with Watney. This is also seen with most of the earth characters as a result of a lack of specific focus on them or their plight. This causes the viewer to not really care about the earth characters who become boring in the face of Watney’s greatness. My main issue with the film is more a preference and suggestion for what would have made a better movie. The Martian suffers from an equal focus on Watney and his interesting Castaway plot, and NASA and its less interesting characters and Apollo 13-style plot. I feel The Martian would have vastly improved if the entire film was centered only around Watney. If the viewer never saw other people, Watney’s sense of loneliness and hopelessness would be transferred to us. If the viewer never learns that rescue is on the way from NASA, it vastly increases the suspense as to whether or not Watley will survive and will make his eventual rescue all the more satisfying because all the tension that was built up throughout the movie pays off, instead of the viewer knowing the details of his rescue. Tonally it would be a far superior film, and the focus would be on the best character and the most interesting parts. In addition, that would make more room for beautiful glamor shots of the Martian landscape, of which there were surprisingly few of in the real movie. Another piece of criticism I have, although this may just be a nitpick, is towards the use of Sols as a unit of time instead of days. In The Martian, time is measured in Sols, an undefined unit of time that was used to make the film more “science fictiony.” Because the audience is never told how long a Sol is in terms we can understand, any impact as to how long Watley is on Mars is extracted. When NASA says something like “He only has enough food to last him 220 more Sols,” any tension that could have come from that statement is gone because we don’t know how long that is. It might seem like a minor problem, but it really was a tension sponge. 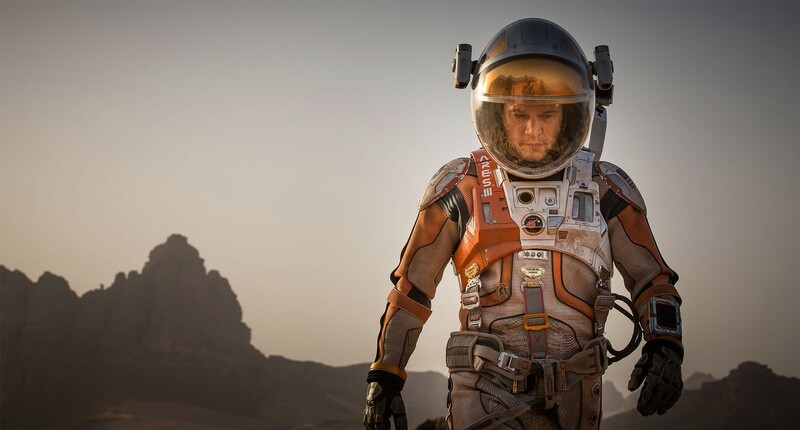 All in all, The Martian is great, but it could have been much better. Its grasp on an Apollo 13-style plot instead of being Castaway set in space stops it from being truly great. However, this is a massively entertaining film and was a blast to watch. The soundtrack, the acting, the majority of the story, the writing, and many characters are fantastic. If you like fun science fiction, then you will really enjoy The Martian and I will give it a B.